Q 1. What is Magento? Ans. Magento is a feature-rich eCommerce platform built on open-source technology that provides online merchants with unprecedented flexibility and control over the look, content and functionality of their eCommerce store. Magentos intuitive administration interface features powerful marketing, search engine optimization and catalog-management tools to give merchants the power to create sites that are tailored to their unique business needs. Designed to be completely scalable and backed by Variens support network, Magento offers companies the ultimate eCommerce solution. Ans. Mage::getSingletone() always finds for an existing object if not then create that a newobject but Mage::getModel() always creates a new object. Q 3. Why Magento use EAV database model ? Ans. In EAV database model, data are stored in different smaller tables rather than storing in asingle table.product name is stored in catalog_product_entity_varchar tableproduct id is stored in catalog_product_entity_int tableproduct price is stored in catalog_product_entity_decimal tableMagento Use EAV database model for easy upgrade and development as this model givesmore flexibility to play with data and attributes. Q 4. How to upgrade to the latest version using Magento Connect? Ans. Upgrading Magento to the latest version is a fairly simple task. Copy and Paste this key magento-core/Mage_All_Latest VIA Magento Connect where it states Paste extension key to install:. This will upgrade Magento to the newest version. Q 5. Explain about the Modules of Magento? Ans. Magento supports installation of modules through a web-based interface accessible through the administration area of a Magento installation. Modules are hosted on the Magento eCommerce website as a PEAR server. Any community member can upload a module through the website and is made available once confirmed by a member of the Magento team. Modules are installed by entering a module key, available on the module page, into the web based interface. Q 6. What technology used by Magento? Ans. Magento uses PHP as a web server scripting language and the MySQL Database. The data model is based on the Entity-attribute-value model that stores data objects in tree structures, thus allowing a change to a data structure without changing the database definition. Q 7. What is MVC structure in Magento? business logic, and user-interface code from one another. Q 8. What is benefit of namespace (package) in magento? Ans. We can have more than one module with same name but they should be placed in different namespaces. All magento core modules are contained in mage namespace. Q 9. How to include CMS block in template file(.phtml)? Q 11. What are handles in magento (layout)? Ans. Handles are basically used for controlling the structure of the page like which block will be displayed and where. First level child elements of the node are called layout handles. Every page request can have several unique Handles. The handle is called for every page. handle for products belongs to virtual product type, PRODUCT_TYPE_simple is called for product details page of simple product type and PRODUCT_TYPE_virtual is called for the virtual product detail page and customer_logged_in handle is called only if customer is logged in. The muster_index_index handle is created by combining the frontName (muster), Action Controller (index), and Action Controller Action Method (index) into a single string and this handle will be called only when /zag/index/index url is accessed. Q 12. What is in magento? Q 13. Which factors affect performance of magento? 1. EAV structure of magento database, even for retrieving single entity the query becomes very complex . Q 14. How to improve magento performance? Enable Apache KeepAlives: Make sure your Apache configuration has KeepAlives enabled. Q 15. How to get the Total Price of items currently in the Cart? Q 16. How to set different themes for logged in users? Q 17. How to create magento custom module? 2. Create Block, controllers, etc, Module directories. Create controller, block and module file as required. 3. Create module configuration file (app/code/local/Zag/Mymodule/etc/config.xml). 4. Create xml file (app/etc/modules/Zag_ Mymodule.xml)to enable/disable module and tell magento system from which code pool that module will be taken. Q 18. How to set different themes for each store? Then, add new design change or edit existing. You can select Store and Custom Design. Q 19. How to make product’s custom attribute searchable in adavance search? Edit the attribute and select “Yes” for Use in Advanced Search. Q 20. How to fetch 5 bestsellers products programmatically? MVC stands for Model-View-Controller. Any application that separates it’s data access, business logicand user interface is called MVC. 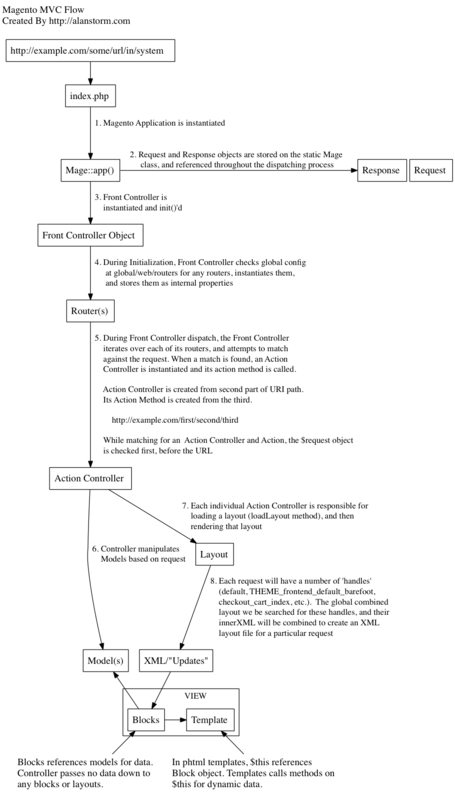 There can be two types of MVC: convention-based andconfiguration-based. Example, cakePHP is convention-based, i.e. you just need to follow the instructions of the core system to get your module ready in just few lines. Magento is configuration-based, i.e. you need to specify each and every thing to your module’s config file in order to get it work. Magento has Controller (for Routing), Block (for Business Logic), Model (for DB access, sql) and Template file (for Presentation i.e. View). 22 =How Magento ORM works? 23. What is EAV in Magento? EAV, stands for Entity Attribute Value, is a technique which allows you to add unlimited columns to your table virtually. Means, the fields which is represented in “column” way in a regular table, is represented in a “row” (records) way in EAV. In EAV, you have one table which holds all the “attribute” (table field names) data, and other tables which hold the “entity” (id or primary id) and value (value for that id) against each attribute. – eav_entity_text (for holding text (mysql Text type) values). EAV is expensive and should only be used when you are not sure about number of fields in a table which can vary in future. To just get one single record, Magento joins 4-5 tables to get data in EAV. But this doesn’t mean that EAV only has drawbacks. The main advantage of EAV is when you may want to add table field in future, when there are thousands or millions of records already present in your table. In regular table, if you add table field with these amount of data, it will screw up your table, as for each empty row also some bytes will be allocated as per data type you select. While in EAV, adding the table column will not affect the previously saved records (also the extra space will not get allocated!) and all the new records will seamlessly have data in these columns without any problem. The difference between Mage:getSingleton() and Mage::getModel() is that the former one does not create an object if the object for same class is already created, while the later creates new objects every time for the class when it’s called. Mage::getSingleton() uses the “singleton design pattern” of PHP. If the object is not created, it will create it. Mage::getSingleton() is mostly used when you want to create an object once, modify it and later fetch from it. Popular example is session, you first create a session object, and then add/remove values from session across different pages, so that it retains your values (e.g. cart values, logged in customer details, etc.) and doesn’t create new session object losing your last changes. Mage::getModel() is used when you want to have the fresh data from the database. Example is when you want to show records from database.